We’re examining the five traits Wild Readers have in common, according to Donalyn Miller’s book, READING IN THE WILD. Have your reading preferences changed over the years? How so? 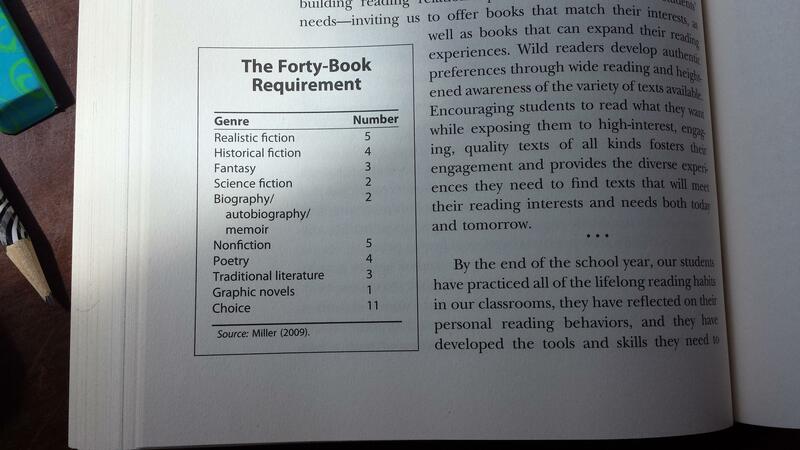 If you are a teacher, how to do you expose your students to a wide range of texts? Thank you, Donalyn, for making such a profound difference and sharing your ideas with the rest of us. I re-read favorite books all the time. And I’m finding that, as I grow older, I enjoy historical fiction more than I did as a child, and I tend to read less fantasy now. What I don’t read enough of is nonfiction. It surprises me to see how much more non-fiction I’ve read in the last few years. Not just research, just plain old books. Also, I was much more interested in fantasy as a girl. Still love a good re-read. I would love to be a re-reader. If I were a faster reader, I would re-read more books. Still, I have re-read a few very beloved books. Reading aloud to my family is a good way for me to enjoy books that I’ve read before! I think it is so important to let kids have the freedom to choose what books (and what kinds of books) they want to read. Otherwise, reading becomes more of a chore than a pleasure. My son went through a phase during which the only thing he would read was BONE (the graphic novel series). I didn’t mind, because he was reading, and he was enjoying it! I remember when my older son read the Horrible Harry series again and again. It was below his reading level, but the stories were about kids his age making their way in school, just like he was. So thankful for those books that have been a haven for my boys…and for my former students.